BlueMagic 1 Step Carpet Stain and Spot Remover for home and auto. Works when others fail, lifts coffee, grease, pet stains instantly with no vacuuming. 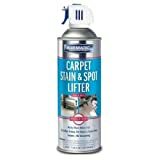 Blue Magic 905-06 Carpet Stain and Spot Lifter - 23 fl. oz. Blue Magic 912 Heavy Foam Carpet Cleaner with Stain Guard - 22 oz.